I’ve listened to country music all my life. I remember sitting under the dining-room table as a child, listening to my parents playing Euchre with the sweet sounds of Randy Travis and John Prime in the background. So, you can only imagine my excitement when I learned I could pass on my love of country music to my two nuts: Peanut and Cashew. Yes, you heard right! The Loews Hotel in Nashville allows you to have your pup cut a CD in a professional recording session. Could Peanut be the next Dolly “Paw” Parton and Cashew the next Darius “Ruff” Rucker. We could have two furry stars on our hands, and we don’t even know it yet. The hotel offers a limo shuttle (of course the dogs have to arrive to the studio in style to show the other dogs how they roll). 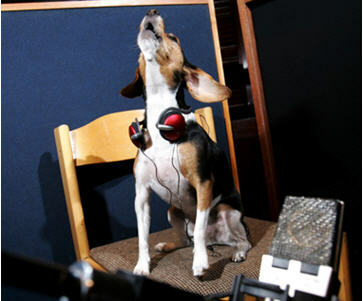 Once situated in the studio, your pup will work with a voice coach, and howl along with a musician or bark to their favorite karaoke tune. I wonder what selections they have: “Who Let the Dogs Out” or another song by BowWow? With it being in Nashville, I have to hope some country makes the list. And that’s life in a nutshell … you learn about something new every day, and most of the time, it gives me a giggle. This one certainly did.